President Donald Trump faces a test in the form of Hurricane Harvey as his administration sought to assure residents of Texas and Louisiana Friday that the federal government is prepared for what new FEMA Director Brock Long called a "very dangerous situation." Long, who was confirmed as FEMA director two months ago after six years as an executive at an emergency management consulting firm, told MSNBC Friday he was expecting a "very significant disaster" along the coasts of southeastern Texas and southwestern Louisiana. Hurricane Harvey, which strengthened into a major Category 4 storm Friday evening, made landfall between Port Aransas and Port O'Connor at around 11 p.m. ET, the National Hurricane Center said. Trump on Twitter Friday night announced that he signed a disaster declaration for Texas "which unleashes the full force of government help!" Trump, who spent the earlier part of his Friday morning tweeting his frustrations with Senate Republicans, praising his chief of staff and boasting about his administration's success, announced shortly before noon that he had spoken with the governors of Texas and Louisiana. “Closely monitoring #HurricaneHarvey developments & here to assist as needed,” he said on Twitter. Hours later, Trump used Twitter to urge "everyone in the path of #HurricaneHarvey to heed the advice & orders of their local and state officials," and then posted again after he arrived at Camp David. "Just arrived at Camp David, where I am monitoring the path and doings of Hurricane Harvey (as it strengthens to a Class 3). 125 MPH winds!" Trump tweeted. How Trump prepares for and responds to Harvey could have an enormous impact on his presidency, presidential historian Allan Lichtman told NBC News. Natural disasters, and how presidents handle them, have regularly shaped the public’s perception of the commander-in-chief’s competence, with the most notorious example being George W. Bush’s handling of Hurricane Katrina in 2005. Lichtman explained it was one of several large factors that led to a Democratic takeover of the House in 2006 and Obama’s win in 2008 — a stark reminder that there are lessons to be learned to avoid huge political consequences. Those would include, “the value of advance preparation and getting ready for the worst, as well as having a fully staffed and very competent FEMA,” Lichtman said. “And of course the lesson that a president should be and act personally concerned with the disaster — both before it happens, and after,” he added. Facing questions about comparisons to Katrina, the White House's Bossert called it a “staggering event” but declined to equivocate the current situation to the devastating 2005 storm. Since Katrina, “what we’ve done is gotten a lot better as a government,” Bossert said, confident in the preparedness of the government for the incoming storm. Critics of the administration, however, have pointed to Trump’s budget proposal, which pitched slashing FEMA funding for state grants and other programs by $600 million, as evidence that Trump remains fundamentally unconcerned with disaster preparedness. Supporters of the president encouraged vigilance. “@realDonaldTrump #hurricane keep on top of hurricane Harvey don't mke same mistake Pres Bush made w Katrina,” Sen. Chuck Grassley, R-Iowa, tweeted Friday, referring to President George W. Bush’s widely criticized response to the 2005 superstorm that left 1,500 people in Louisiana dead. 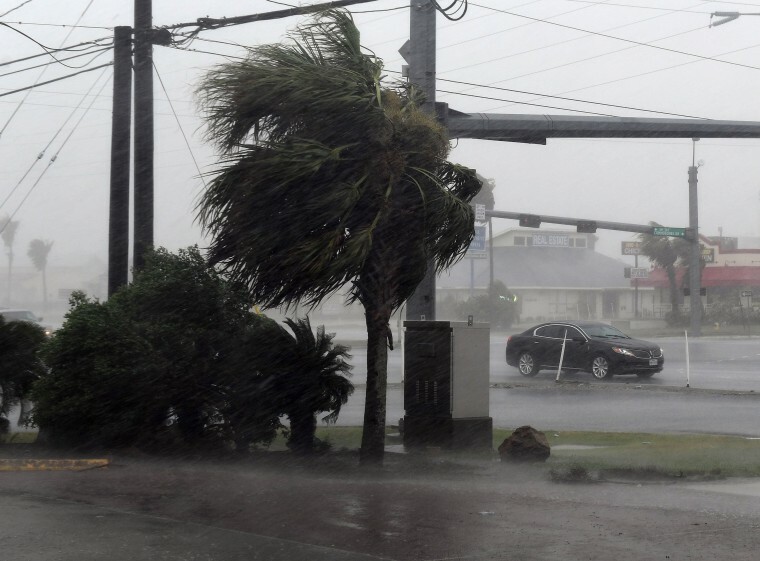 “130 mph winds Texas coast, 25-inches of rain Houston. It’s about to get real…” he added. Drudge later deleted the tweet. The White House said Trump was briefed on the storm on Thursday morning and was being kept apprised of its progress, as well as preparations to deal with it, by Bossert. Bossert, who has also been in regular contact with Long and his FEMA staff, said during a White House briefing that Trump had been "acutely focused on making sure that, and just the right thing by the way, that the American people in the storm’s path have what they need." Trump, as he boarded Marine One, wished “good luck to everybody” in the storm’s path when asked by reporters what he had to say about the impending storm, emphasizing his words with several thumbs up motions. Meanwhile, Abbott activated 700 members of the Texas Army and Air National Guards, the Texas State Guard and the Texas Military Department and preemptively declaring a state of disaster in 30 counties. FEMA has created a support base at an auxiliary airfield near Seguin, Tex., about 140 miles north of Corpus Christi, to have ready water, meals, blankets and other resources for areas that will affected by the storm, according to a release from the agency Thursday. Long has also put Regional Incident Management Assistance Teams in place at emergency operations centers in Austin, and Baton Rouge, La., in anticipation of requests for federal assistance, the agency said. Life-saving commodities and search and rescue teams have been put in place in the state, too. The agency’s Twitter and Facebook feeds, meanwhile, have blasting warnings urging people in the storm’s path to comply with evacuation orders from their local officials and sharing the latest weather forecasts. In Texas, only local and county officials have the authority to order evacuations. Long, during his interview with MSNBC, warned affected residents they must use what little time they have left to get ready — or flee. "The time to evacuate and heed the warning is quickly coming to a close," he said, refusing to hold back in predicting the storm's fury. "Look," he said. "This is going to be a disaster."